Merry Christmas! Today was a treat as my siblings and their families gathered together. It had been twelve years since all of the cousins had been together. My brother Doug's kids are in town from New York, Washington DC and Illinois. 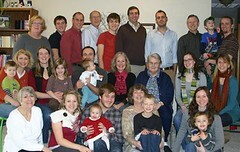 My sister Susan's kids from Michigan and Renton, and sister Ellen up from Sacramento were all gathered. Two new granddaughters, Ada and Rachel, added a special touch. My nephew Aaron and wife Jen hosted the event. It was a little bitter sweet as the thrill of catching-up was tempered by the reminder of our mother's deteriorating mental health. She moved to a new facility this week and we are all dealing with the transition. In spite of this challenge, we are grateful to God as a family for His rich blessings.